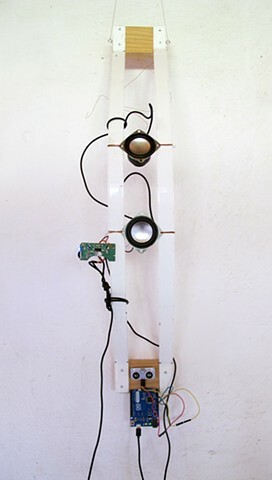 Speakers, aluminum, wood, micro-controller, ultrasonic sensor, Pure Data patch, Siti Bauw soundscape. A precursor to the larger installation Siren Song. As viewers approached the sculpture the soundscapes volume changes and the melody dissolves into distortion. A sample of the undistorted audio can be heard here.